Democratic Muslim Minnesota Rep. Ilhan Omar is calling for an investigation into USA Powerlifting’s decision to bar a trans-identified athlete from competing against women, saying she doesn't believe he has a “competitive advantage” over women. The 37-year-old Somali-American first-term congresswoman claims that the organization’s policy barring biological men from women’s competitions violates the Minnesota Human Rights Act, which prohibits discrimination on the basis of gender identity and other social identifiers. In a letter sent to USA Powerlifting Executive Director Priscilla Ribic on Jan. 31, Omar criticized the organization for barring one of her constituents, JayCee Cooper, a biologically male trans-identified athlete from competing against women in Minnesota. Omar has refused to believe that biological men are stronger than women, saying it's a "myth" and "discriminatory behavior" to think such things. USA Powerlifting, which oversees and organizes powerlifting competitions across the country, maintains that male-to-female trans-identified athletes are not allowed to compete in women’s competitions because of the fact it gives them a competitive advantage in a strength sport. But Omar, who along with other Democratic women elected to Congress in 2018, is seen as the new face of a more liberal party, and doesn’t buy USA Powerlifting’s reasoning. Omar urged the organization to reconsider the “discriminatory, unscientific policy” and follow in the footsteps of the International Olympic Committee, which allows biological men who identify as women to compete in women's events if they meet certain testosterone limits. “The myth that trans women have a ‘direct competitive advantage’ is not supported by medical science, and it continues to stoke fear and violence against one of the most at-risk communities in the world,” Omar argued. 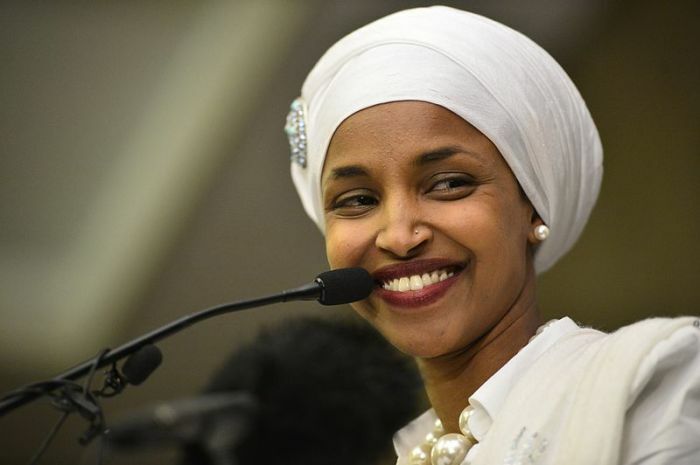 Considering that Omar is a U.S. congresswoman, she doesn’t have jurisdiction regarding violations of state law and federal law doesn’t prohibit discrimination on the basis of gender identity. The letter was first made public earlier this week when Cooper posted a picture of the letter to Instagram. The authenticity of the letter was confirmed by Omar’s office, The Daily Caller reports. In January, USA Powerlifting released a statement explaining its policies regarding trans-identified athletes following Cooper’s denial. The statement also outlined while it does allow female-to-male athletes compete in men’s events, it doesn’t allow them to take testosterone or other androgens used for gender transition therapy because of the “anabolic nature” of the compounds. The ban on the substances applies to all medical conditions. In a FAQ section, USA Powerlifting asserts that it's not banning transgender athletes. “We are a sports organization with rules and policies,” the statement stresses. “They apply to everyone to provide a level playing field. We have restriction such as age eligibility, who can compete at our national events and so on. On a number of occasions in recent years, trans-identified biologically male athletes have dominated various female sporting events. One example is high school wrestler Mack Beggs, who won the Texas 6A girls championship in the 110-pound division two years in a row, beating out the same biological female competitor twice in the championship. Parents in Connecticut voiced outrage after two trans-identified students took home the top two spots in the in the 100-meter race at the state finals last June. Parents and coaches launched petitions against Connecticut Interscholastic Athletic Conference’s rules allowing trans-identified athletes to compete.